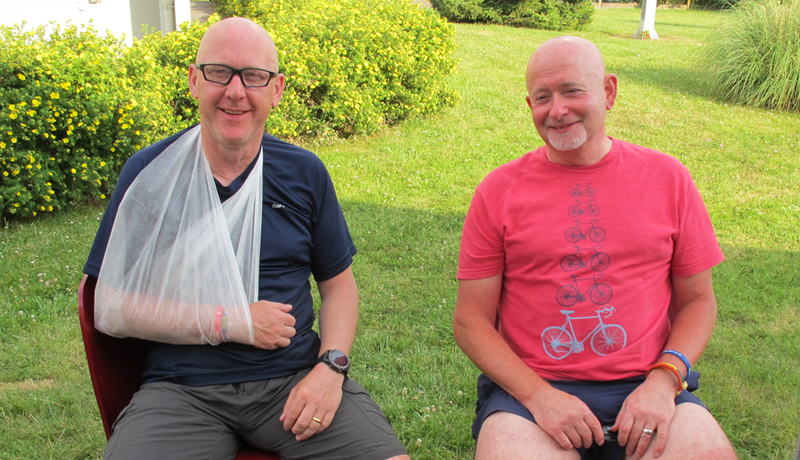 Dave had some tough challenges along the way, but the support of the group and the strong friendships he formed pulled him through to the finish line. 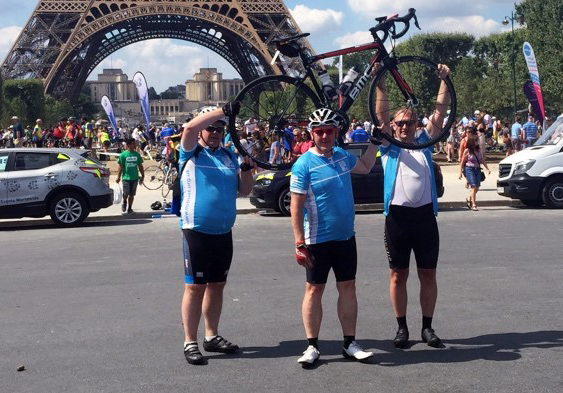 I was delighted to be asked to write about the London to Paris cycle I completed last July, as the MS Trust is such an important charity. Why did I ride? I was diagnosed with progressive MS. I wanted to make sure I contributed whilst I had the opportunity, and besides, I needed a goal, something to push for. My close friend Dean agreed to accompany me on the ride. I spent about 7 months training and preparing myself for the event, losing 26kg on the way which meant that I was reaping the benefits even before I arrived in London. We met up with the group in the morning and set off for the coast. It was very hot, which was particularly tough as it can be a trigger for MS symptoms, but the whole group was aware of the issues and the support was amazing. The ride to the coast was just great fun, people I’d never met before became friends within minutes, there were no barriers between us. We were all cyclists trying to make a difference, the connection was obvious. We got to Folkestone and met in a pub. After over 90 miles, a beer with new friends was a welcome break and when we set off in convoy to the ferry the atmosphere was amazing. I’m ex Royal Navy and I’m used to teamwork and comradeship on an extreme level and here I was riding to the ferry in a group that reminded me of a team that I hadn’t experienced in years. Once we arrived in Calais it was dark but the buzz was very high, we were in France and we’d ridden there. I remember riding with Rita who I’d never met before and we instantly became good friends. There we were, a group of strangers at the start of the day that were now friends, chatting about the day’s events. My first day in France turned out to be an eventful one. A part failed on my bike riding up a hill, it suddenly stopped from about 20mph and I was thrown unceremoniously into the side of the road, down a ditch. I dislocated a shoulder and later learned that I had cracked my coccyx. Ouch. There was a checkpoint about 2 miles up the road for another London to Paris group and after being helped out of the ditch I set off pushing my bike up what now felt like Mount Everest. Their Doctor and a mechanic helped relocate my shoulder and fixed my bike for me. I remember the group I rode with that day as they were fantastic; Dean, Paul and Richard couldn’t do enough to help out. Getting on the bike one armed was a fun challenge and the guys were very helpful and encouraging. They understood that I would not be letting down the MS Trust or my supporters by not completing every mile. Needless to say, there was a lot of chat that evening (once we had watched the day's Tour de France stage), a few beers, good food and a good night’s rest. The next day, aside from the fun of riding with a damaged shoulder and a sore bum, and with the support and encouragement of the whole group, it was an amazing ride with great views, good weather and refreshments. I wasn’t riding very fast by now, but it was not an issue for anyone. The organisers (Skyline) and Laura form the MS Trust were there throughout the day with a few words of encouragement and painkillers, it made a real difference. Paul sat by my side throughout making sure I was OK, keeping me going with great words of encouragement and making sure I was coping with the pain from the crash, and Dean kept coming back to offer support as well. The catering was great, we were well fed and watered throughout the whole event. We had a little fun as the local kids thought it entertaining to remove or change the direction markers and I remember us riding up and down a big hill trying to figure out where we needed to go. There was a big group of us and we rode at least another 15 miles that day, but it didn’t matter as we made the most of it. We got up in the morning and the excitement was amazing; we had got this far, we were going to complete this as a group. We had lost no one, we were all intact (some more than others) and excited at the day ahead. We rode to Paris, stopping along the way at a café where the owner was a bit surprised at nearly 100 cyclists all wanting coffee and cake at the same time. Sitting there in the sun talking about the ride so far and how it would be to ride into Paris with a group of friends was something I’ll never forget. It was one of those moments in life that make it all worthwhile. As we arrived in Paris the mood was alive, we were high-fiving each other, shaking hands, taking pictures and enjoying the moment as we rode along. I remember most vividly the sound of horns beeping and the locals clapping and cheering. I’m sure they’ve seen it before, many times, but the noise and support was out of this world, it brought me to tears. In fact, I’m a little teary eyed as I remember that moment. We rode up the Champs-Élysées towards the Eiffel Tower and it felt surreal. I love my cycling, I watch the Tour de France and all the other events with a passion and here I was, on my bike. I’d ridden there under my own steam, riding the same route that Chris Froome and the rest of the Tour would be riding the next day. Wow. We arrived at the Eiffel Tower and my wife was waiting with a big smile, a big yellow banner, a huge hug, a cry of pride and a huge kiss. She embraced not only me but also Dean and anyone else close enough. She was so proud of me, I was so proud of her, she knew what it meant for me to show my MS that I was in charge, not it. I also had to explain the little injuries I’d picked up along the way, but that didn’t matter, I was there. We stood in front of the tower as people picked up their bikes, lifted them above their heads and posed for the obligatory picture. I couldn’t lift my bike as my shoulder was still in pieces so Richard and Dean held it up above my head for me, thanks guys. We met up that night for a post-ride celebration, a bit of yodelling (thanks Pete) and some good food. Marlan, who had flown over from the US, auctioned off his bike to raise yet more money for charity. We slept the sleep of kings that night. Later the next day we met up at the Eurostar station as a group and got the train back. The chat and the noise was amazing as we realised that the event was to end in London when we picked up our bikes. We would disappear home with our memories and the thought that we’d raised money to help the MS Trust in their valuable work. But, I was wrong. It didn’t end there, in fact it still hasn’t. The Facebook group that was set up before the ride came alive as we chatted about what we’d achieved, relived moments and continued to support each other. A year later, a lot of the people I met have become friends, we chat regularly, support each other and share moments. There’s talk of a reunion ride, a lot of the group are meeting up for the London to Amsterdam ride in 2018 and if I am fit enough and the MS lets me, I will ride with them. I was asked to write a few hundred words about the event, but that’s not enough to describe such a moment in one’s life. Every member of the MS Trust group rode for me and my MS, to help me get better, or to help the next generation. They showed me that people care about MS, that they see the impact it has on our lives, how it limits our day-to-day activities and they wanted to help. I’m humbled that you rode for me, for the others on the ride who also have MS and for those unable to ride. You’re all heroes. Please stand up, take a bow and our thanks. I eventually recovered from my crash, I couldn’t sit comfortably for around four months, the shoulder healed but the MS remains. My eyesight is poor, I wobble more than I used to, but with my friends I did something fantastic. I write so passionately about the people, the support and the friendship as it’s so important to me, it’s what I will remember for the rest of my life. I wrote this for two reasons. The first is to encourage others to ride for the MS Trust, to help make a difference. The second is to share what was a very proud and life-changing few days of my life where I saw and felt real friendship, support and caring for others with life-changing illnesses. I choke back a little tear as I write this, I hope you feel it as you read it, and that it encourages you to undertake a similar journey. My name is David Evans, I have MS. In July of 2016 I got on my bike and rode from London to Paris for the MS Trust to make a difference, to change people’s lives. Will you?